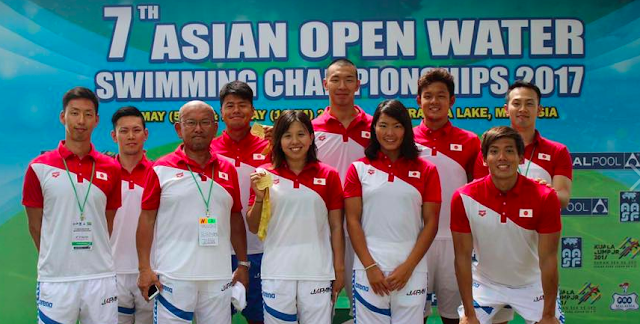 The Daily News of Open Water Swimming: Japan Is Right On, But What Were Others Thinking?!? Japan Is Right On, But What Were Others Thinking?!? While the 5 km race in Malaysia at this week's Asian Open Water Swimming Championship went off without a hitch, the water warmed up to 31.9°C (89.42°F) before the 10 km race. Team Japan - rightly so - pulled its swimmers from the event. 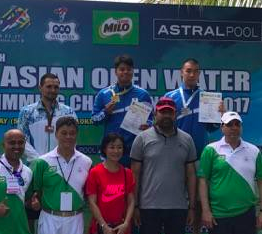 But under the auspices and guidance of Ronnie Wong, the 2017 Asian Open Water Swimming Championship went on, despite FINA's own maximum temperature rule of 31°C (87.8°F). Yasunari Hirai and Yumi Kida of Japan were anxious to go 2 for 2 in the 5 km and 10 km Asian Championships after their victories in the 5 km [see photo above], but they understood the health risks in racing over 10 km in water over 31°C (87.8°F). "Although nothing surprises me anymore in the sport, I really do not understand this decision - especially it places human lives in danger," remarked Steven Munatones. "This rule took several months of deliberation by and within FINA to implement - precisely because Fran Crippen died under such conditions. FINA already caused controversy when it decided to move forward with its 25 km race at the 2009 World Championships when the water temperatures exceeded 31°C, but here is another example of a major championship event that demands that its athletes race in extremely warm water. I greatly respected Alex Meyer of the USA, Thomas Lurz of Germany, and Marcel Wouda of the Netherlands for standing up and pulling out of the 2009 FINA World Championships because of dangerously warm conditions. And I greatly respect Team Japan for standing up for its own athletes and putting health and human life over medals. Like Alex, Thomas and Linsy Heister who were world champions when they protested and pulled out of the FINA event in 2009, Team Japan had the overwhelminng pre-race favorites - Hirai on the men's side and Kida on the women's side - who would have undoubtedly won a podium position and quite possibly a gold medal. Yet Japan did the right thing and abided by FINA's own rules* and put life over medals." Vitaliy Khudykov of Kazakhstan won the 10 km marathon swim with Cho Cheng-Chi Chinese Taipei in second and Heidi Gan of Malaysia won the slow-paced 10 km marathon swim with Xeniya Romanchuk finishing second. The race started at 8 am and hit its peak water temperature of 32°C towards the end of the race. FINA OWS 5.5 The water temperature should be a minimum of 16°C and a maximum of 31°C. It should be checked the day of the race, 2 hours before the start, in the middle of the course at a depth of 40 cm. This control should be done in the presence of a Commission made up of the following persons present: a Referee, a member of the Organising Committee and one coach from the teams present designated during the Technical Meeting. It is interesting that Wong served as the chairman of the FINA Technical Open Water Swimming Committee when this rule was debated, researched, submitted and passed, but the water temperature at the Asian Championships 10 km race - that were conducted under his leadership - exceeded this maximum water temperature before, during and after the race. At least one delegation - Team Japan - had the best interests of its athletes in mind - especially since four of the athletes were transported to local hospitals to receive medical attention.